by Krajewski, Lee J.; Malhotra, Manoj K.; Ritzman, Larry P.
For undergraduate and graduate operations management courses. 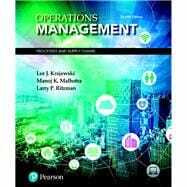 Operations Management: Processes and Supply Chains provides students with a comprehensive framework for addressing operational process and supply chain issues and uses a systemized approach while focusing on issues of current interest. The 12th Edition provides ample opportunities for students to experience the role of a manager with challenging problems, cases, a library of videos customized to the individual chapters, simulations, experiential exercises, and tightly integrated online resources. Daley Chair in Management. In addition, he received the National President’s Award and the National Award of Merit of the American Production and Inventory Control Society. He served as president of the Decision Sciences Institute and was elected a Fellow of the Decision Sciences Institute in 1988. He received the Distinguished Service Award in 2003. Krajewski received his PhD from the University of Wisconsin. Over the years, he has designed and taught courses at both graduate and undergraduate levels on topics such as operations strategy, introduction to operations management, operations design, project management, and manufacturing planning and control systems. Krajewski served as the editor of Decision Sciences, was the founding editor of the Journal of Operations Management, and has served on several editorial boards. Widely published himself, Krajewski has contributed numerous articles to such journals as Decision Sciences, Journal of Operations Management, Management Science, Production and Operations Management, International Journal of Production Research, Harvard Business Review, and Interfaces, to name just a few. He has received five best-paper awards. Krajewski’s areas of specialization include operations strategy, manufacturing planning and control systems, supply chain management, and master production scheduling. the American Production and Inventory Management Society (APICS). Malhotra has conducted seminars and consulted with firms such as Avaya, BMW, Continental, Cummins Turbo Technologies, Delta Air Lines, John Deere, Metso Paper, Palmetto Health, Sonoco, Verizon, Walmart, and Westinghouse-Toshiba among others. Apart from teaching operations management, supply chain management, and global business issues at USC, Malhotra has also taught at the Terry School of Business, University of Georgia; Wirtschaftsuniversität Wien in Austria; and the Graduate School of Management at Macquarie University, Australia. His research has thematically focused on the deployment of flexible resources in manufacturing and service firms, operations and supply chain strategy, and on the interface between operations management and other functional areas of business. His work on these and related issues has been published in the leading refereed journals of the field such as Decision Sciences, European Journal of Operational Research, Interfaces, Journal of Operations Management, and Production and Operations Management. Malhotra has been recognized for his pedagogical and scholarly contributions through several teaching and discipline-wide research awards. He is the recipient of the Michael J. Mungo Outstanding Graduate Teaching Award in 2006, the Carolina Trustee Professor Award in 2014, and the Breakthrough Leadership in Research Award in 2014 from the University of South Carolina. He has been the program chair for international conferences at both the Decision Sciences Institute (DSI) and Production and Operations Management Society (POMS). He also served as the President of POMS in 2017 and continues to serve on the editorial boards of top-tier journals in the field. Larry P. Ritzman is Professor Emeritus at The Ohio State University and Professor Emeritus at Boston College. While at The Ohio State University, he served as department chairman and received several awards for both teaching and research, including the Pace Setters’ Club Award for Outstanding Research. While at Boston College, he held the Thomas J. Galligan, Jr. chair and received the Distinguished Service Award from the School of Management. He received his doctorate at Michigan State University, having had prior industrial experience at the Babcock and Wilcox Company. Over the years, he has been privileged to teach and learn more about operations management with numerous students at all levels–undergraduate, MBA, executive MBA, and doctorate. chair for several other professional organizations. Ritzman’s areas of particular expertise are service processes, operations strategy, production and inventory systems, forecasting, multistage manufacturing, and layout. An active researcher, Ritzman’s publications have appeared in such journals as Decision Sciences, Journal of Operations Management, Production and Operations Management, Harvard Business Review, and Management Science. He has served in various editorial capacities for several journals.